Congratulations to our U14 players and management team on their hard fought extra time win over The Nire in the Western Division 1 Football Final played at Fraher Field this afternoon. Trailing by 2-2 to 0-2 at half time, the lads put in a storming second half performance to level the scores at 2-3 apiece at the end of the game. A goal with the last kick of the first period of extra time set the team up for a 3-5 to 2-6 victory, thereby securing back to back titles at divisional level. Shortly after 9:00am this morning a helicopter carrying world renowned rock band, U2 with all four members (Bono, The Edge, Larry Mullen and Adam Clayton) on board, touched down in our club grounds for a brief visit to the town. Following their engagements in Dungarvan, the lads returned to the field before departing for Dublin at around 11:30am. All four were very complimentary of our grounds, posed for photographs and signed autographs. They also graciously signed a hurley for the club to mark the momentous occasion. L to R: Helicopter Pilot, Bernard Shields, Jason O'Donovan, Bono, The Edge, Larry Mullen, Martin 'Switchy' O'Donnell, Ian Kiely, Paddy Keohan, Adam Clayton, Niamh Enright, Jonathan O'Donovan, Helicopter Pilot. On Saturday last our Under 16’s travelled to Walsh Park to play in the Division 1 Football County Final against De La Salle. The boys started very well with brilliant defending, passing, tackling, blocking and scoring and led at half time 0-9 to 0-2 playing with a strong breeze. In the second half they upped their intensity even more and played an excellent team game and ended with a well deserved win 0-13 to 1-2. After the game Eoin Flynn received the cup of behalf of the team. After the match the team returned to the Park Hotel for a celebratory lunch. Panel: Jake O’Riordan, Eoin Ahearne, Seán Kent, Eoin Flynn Cian Fagan, Dáithí Brunnock Meldan O’ Dwyer, Shane Kiely, James Riordan, Jake Moore, Ben Flynn, Dean Beresford, David Hayes, Michael Kiely, Danny Reynolds, Jamie Walsh, Oisin Hallahan, Senan Travers, Eoin Bohane, Cian O’ Riordan, Ruairi Cusack, David Shields, Sean Roche, Patrick Fitzgerald, Rory Ahearne. 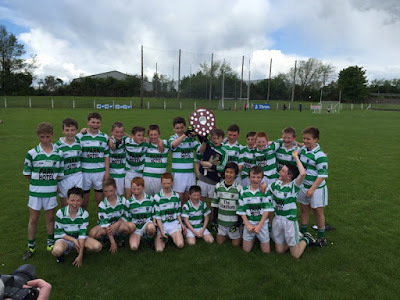 Well done to our Under 13 football team who on Sunday morning last produced their best display of the championship so far to win the Western Under 13 Football title. They beat a strong St Pats team in the final by 4-5 to 5 points at the Fraher Field. This team has trained very hard since the start of the championship and after a shaky enough start to the campaign the team improved with every game to be crowned worthy champions at the end. A big thank you must go to all the players, management and parents involved. We now move onto the County Final where we will take on the Eastern champions. Our minor football team took on Dungarvan on Thursday night last at home. 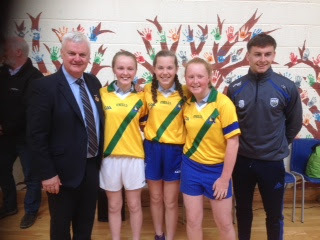 Our team played well throughout to come away with victory in the end against a gallant Dungarvan display. We played the county football semi final last Tuesday evening at a rain soaked Tramore. Unfortunately we lost out by the narrowest of margins on the night, but we cannot fault the effort of the lads in training or playing matches. We are due to play a Western Football Final this Saturday morning in Fraher Field versus the Nire. 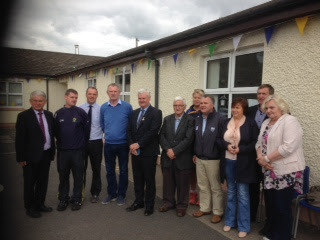 Preparations continue for the Féile which is on the 3 weeks. 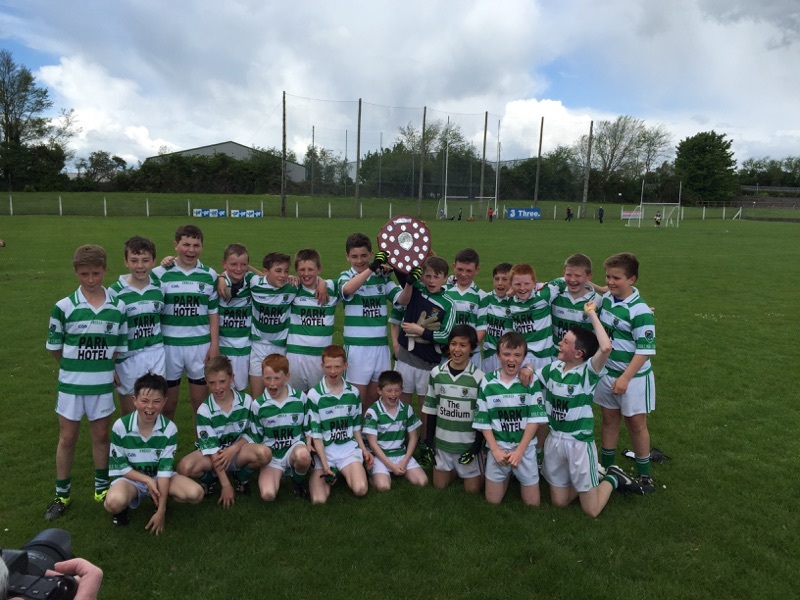 Our U12s hurlers took on An Ghaeltacht in the fourth round of the Town and Country League. The weather was not the best on the night but the lads played well under the circumstances and won at the final whistle. Our next game is against St Patricks on the 3rd June. The panel was: Charlie Gough, Oisin Brazil, Andrew Norris, Jack Kiely, Michael Walsh, Fergie Slevin, Charlie Treen, Jack McGrath, Rian Cosgrave, Seanie Callaghan, Rory Tyrell, Tomás Nee, Conor Bohane, Aidan Higgins, Eoin Kiely, Mark McCarthy, Edmond Spratt and Eddie Phelan. Our Under 10 hurling team played a friendly match against An Rinn on Wednesday night last and against Lismore on Monday night last in preparation for the annual Ballyduff Upper blitz which takes place on Friday night next. Our “Mini” All-Ireland Hurling Series for U8 & U9 got underway on Saturday morning last at the club grounds. We played a total of six (6) games in the fabulous May sunshine. In Round 1, there was wins for Kilkenny over Dublin, Clare over Tipperary & Galway over Limerick. In Round 2, there was a draw between Dublin & Tipperary, who each scored five goals. Kilkenny recorded their 2nd win, when they beat Galway, whilst Clare & Limerick, played an exciting draw with a score of four (4) goals each. We will feature a number of games each week & this week, we watched Dublin play Kilkenny & Tipperary. Dublin versus Kilkenny - Kilkenny made a great start, they were first to score, & with strong performances from Tomas Barrett & Jonathan Tutty, and they quickly built up a halt-time lead of two goals to one. Dublin responded well, with James O’Donnell scoring & who it must be said, was extremely unlucky not to have bagged 3 or 4 goals in the game. Darragh Mansfield stretched the lead for Kilkenny with a fine goal; however further Kilkenny scores were hard earned against a Dublin defence led by Conor Byrne & Caolan Barrett.Kilkenny finished stronger & closed out the game with a two goal advantage, with Sean Kiely & Jack Hurney playing well through-out the game for the winners. Kilkenny go into next week’s games as firm favourites & will be looking to Eoin Hackett, Simon Power & Jake Drummey to keep up the high work rates they put in against Dublin. Tipperary versus Dublin - This was a very even game, ending five goals each. Either team could have taken the honours however a draw was the fairest result. Louis Simms & Jack Fischer were outstanding for Dublin & never stopped working. Kaelen Barry & Archie Mattiuzzi were very influential for Tipperary, who also had Matthew Walsh, Rian Keohan & Diuran Norris playing well. Tipperary led at half time by two goals to one. It could have been a Tipperary win, only for some excellent saves from Andrew Duggan in the Dublin goal. Charlie Burns raised a number of green flags for Tipperary, who also had good performers in Colm Poland & Oisin Navin. If you are between the ages of 7 & 9 & would like to participate in the Mini All-Ireland League, please come out to the club grounds on Saturday morning & you will get a game. Well done to our U13 players and management on their fantastic 4-4 to 0-5 win over St. Pat's in this morning's Western Division 1 Football Final played at Fraher Field. This victory secured a two-in-a-row and fourth in five years of divisional titles at this grade. Congratulations to our U16 players and management team on their excellent 0-13 to 1-2 victory over De La Salle in the County U16 Division 1 Football Final played at Walsh Park this morning. This win sees us retain the title won last year and is the third victory in four years at this grade. Back Row (L to R): Bernard Gorman, Stephen Power, Cian Moloney, Brian Scanlon, Eoin Enright, Peter Phelan, Michael Browne, Mark Gorman, Philip Wade, Daryl Ryan, Kelvin Brady. Middle Row (L to R): Jim O'Mahony, Shane Donnelly, Jason O'Brien, Eddie Casey, Patrick Hurney, Ronan Fleming, John Kindregan, John Gorman, Cillian Barry, Anthony Whelan, Eoin Brackett, Seamie Murray, Pajo Lanigan, Paudie Donnelly. Front Row (L to R): Declan Byrne, Joey Mullen, Séamus Shields, Mark Fives, Simon Hanrahan, Patrick Lynch, Richie Foley, Tiernan Murray, Mark Ferncombe, John Cosgrave. 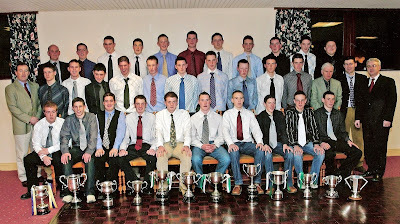 This week's photo comes from the club social of 2004 and shows the Minor Hurling and Football panels that won the Western and County Titles the previous year. This was the third time in the club's history that the Minor Double was completed and the first since 1976. Our ever popular Jack the Joker fundraiser continues this Sunday night in Alice O’Connors where the jackpot is €5,200 as on Sunday night last Kay O’Connor was drawn out of the drum and chose card number 23, which when turned was not the Joker though she did win €50. Noah Landers and Bridget Kiely won €25 each. As well as our group of ticket sellers tickets can be purchased from Convenience Store Ballinroad, Village Flowers, Spar, Mousies Takeaway, Minnies Bar, Abbeyside Post Office and Crotty’s Corner Bar. Our Junior B Hurlers will play their first match in the championship this Saturday when they play Shamrocks in Cappoquin at 7pm. We played Roanmore on Friday night last in our first game of the County Championship in Kill. The team gave a very good performance on the night especially in the first half to emerge as six point winners. Our next game is against Cappoquin on the second weekend in June. TEAM: S. ENRIGHT, J. DUGGAN, E. COLLINS, S. O’DONOVAN, C. PRUNTY, R. FOLEY, J. O’MAHONY, D. COLLINS, E. BERGIN, N. MONTGOMERY, J. HURNEY, S. DALY, M. FERNCOMBE, M. O’HALLORAN, P. HURNEY. SUBS: M. GORMAN, S. CROTTY. If any member wishes to order tickets for the Waterford/Clare Munster Championship match they are asked to please let Jonathan O’Donovan know as soon as possible. Our club bingo will continue this Sunday night in the CBS Hall with a jackpot of €1550. On behalf of all in the club we would like to send our sympathies to the family and many friends of the late Trevor Crotty, Dungarvan who passed away so tragically last week. Our thoughts and prayers are also with all the members of Dungarvan GAA Club as they come to terms with the untimely passing of another of their valued playing members. Over the weekend, ball stop netting was erected behind the far end goal of our new field. 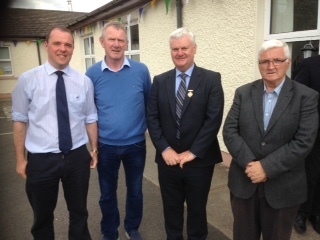 Many thanks to 'Hiker' McGrath, Michael Briggs, Ian Kiely, Bernard Shields and Eddie Cashin for all their hard work. This is another great addition to our club facilities which we hope to enhance even further over the coming months and years. Back Row (L to R): Eoin Bergin, Ross Dunford, Jack Duggan, Laurence Power, Patrick Lynch, Eoin Enright, Mark Ferncombe, Stephen Enright, Patrick Hurney, Gavin Breen, Gary Hurney, Michael O'Halloran, Seán Daly, Shane Briggs, Mark Gorman, Stephen Cliffe, Stephen O'Connor. 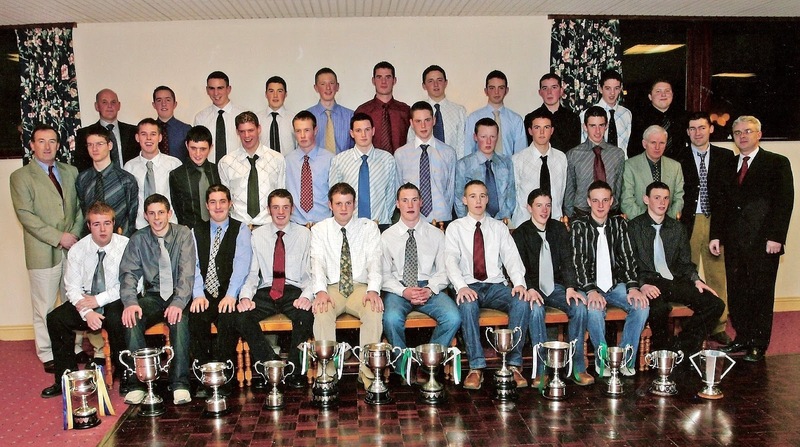 Front Row (L to R): John Power, Mark Fives, David Collins, Tiernan Murray, Shane O'Donovan, Brian Looby, Richie Foley, James O'Mahony, Seán O'Hare, Maurice Power, John Hurney, Conor Prunty, Evan Collins. Last night, Abbeyside began it's County Senior Hurling Championship campaign for 2016 with a 1-16 to 0-13 victory over Roanmore at Kill. This week's photo brings us back two years and the last time we met the city men at the same venue. A tough encounter saw us emerge victorious on a scoreline of 1-20 to 2-12, thereby securing qualification for the knock-out stages of the championship. Our ever popular Jack the Joker fundraiser continues this Sunday night in Alice O’Connor’s where the jackpot is €5,000 as on Sunday night last the Cosgrave family was drawn out of the drum and chose card number 53, which when turned was not the Joker though they did win €50. Colm O’Hare and David Terry won €25 each. As well as our group of ticket sellers tickets can be purchased from Convenience Store Ballinroad, Village Flowers, Spar, Mousies Takeaway, Minnies Bar, Abbeyside Post Office and Crotty’s Corner Bar. Our Junior B Hurlers begin their championship campaign this Sunday at 12 noon when they take on Geraldines in Dungarvan Club Grounds. We play Roanmore this Friday night in our first game of the County Championship in Kill at 7:30 pm. Our club bingo will continue this Sunday night in the CBS Hall with a jackpot of €1500.